pour mixture back into small pan and heat. reduce if desired. I reduced mine on low heat for another 10-15 minutes. 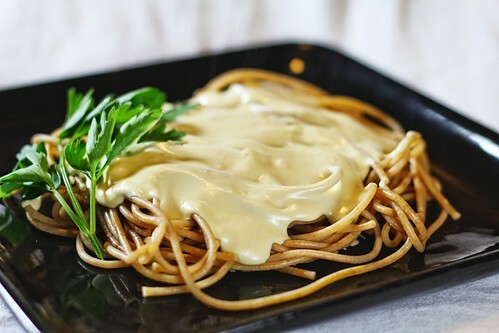 serve over cooked pasta. (we used whole wheat spaghetti). garnish with some red pepper flakes and fresh Italian parsley. I'm not vegan, but I just love this idea of a nut based sauce. Hope I can try out very soon! This looks quite lovely. Regan: I was tasty. Nuts are great! first time here..wonderful space you have..
jay: thanks for stopping by! camelia: thanks posting the same comment several times with different names.